Being a volunteer at The Raptor Foundation offers not only the satisfaction of helping a worthwhile cause, but also affords the privilege of getting close to the birds and gaining an insight into and understanding of birds of prey. We aim to fully involve all of our volunteers in all aspects of The Raptor Foundation, from cleaning the birds in the morning, to helping out with flying displays during the day and finally feeding and putting the birds to bed at night. If you feel you would like to help out as a volunteer, please contact us. You should be prepared to put in some hard work, but you will find the experience very rewarding. 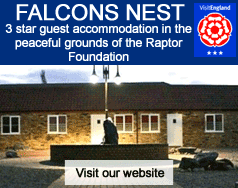 Volunteers are welcome to help out in all aspects of day-to-day running of The Raptor Foundation. We need people to help out in the Gift Shop and around the site, as well as helping out with the birds. If you have any particular skill that you may think will be of help, please contact the centre. We work very closely with all the local schools to place students within the working environment at the Raptor Foundation. Any students wishing to do work experience with us need to contact us either directly or through their school. We also offer work experience placements to college students doing animal welfare and animal management courses and vet students looking to get an insight into birds of prey.